First impressions undoubtedly set a tone that will forever tinge the perception one has of another person or thing-such as a piece of entertainment. The first impression given by Life is that of an old fashioned horror movie. Sure, the comparisons to Alien are easy and to obvious extents, valid, but Life gives such an immediate indication of being inherently old fashioned in its approach to what would still be new frontiers that one can't help but to allow those tendencies to carry on throughout the entirety of the film even as it becomes slightly silly and a little long in the tooth. Life accomplishes such vibes by taking pride in showing the audience things we've become conditioned to by the movies that truly are spectacular were we to actually step back and appreciate them once in a while. Whether it be something as simple as the view of earth from space or the way in which director Daniel Espinosa's (Safe House) camera flies as effortlessly through the spacecraft in zero gravity as the characters do-these actions and spectacle are more appreciated due to the sense of sincerity the tone and score from Jon Ekstrand give off. 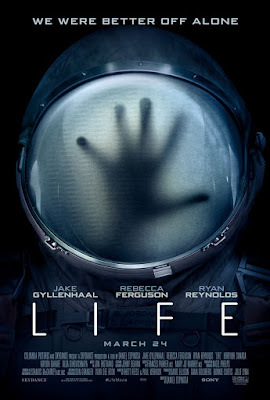 Espinosa's film, which was written by the guys who wrote Deadpool and Zombieland (Rhett Reese, Paul Wernick), places itself squarely into the horror mold while utilizing the always compromising environment that is outer space to heighten the tensions and push the suspense up to eleven. 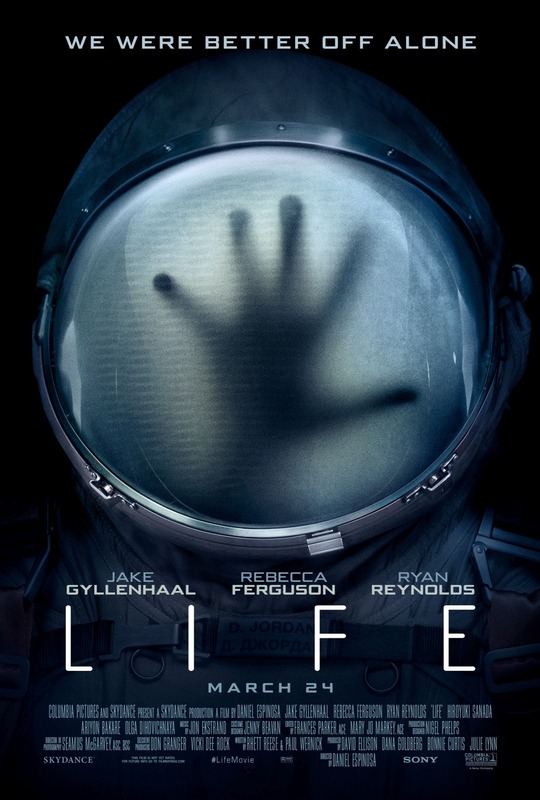 In short, Life doesn't take so many notes from space movies as it does scary ones. Life is a thriller that means to make you claustrophobic despite the fact escaping said confined space would result in a slow, likely agonizing death. There are no good options except to stay and fight and so, as our six man crew is picked off one by one, we are exposed to the dangers of curiosity outweighing fear. We are exposed to how being blinded by what such discoveries promise can distract from the potential trouble at hand, but Life never becomes too heavy handed or ham fisted in these explorations of our psychologies or mentalities. Rather, the film finds a large entertainment factor in coming up with different types of situations to find that tension and suspense in-leaving the larger ideas to fill in the gaps in between; almost as if the residuals of the more striking moments are intentionally left to linger and for viewers to comprehend once the shock wears off. It's an idea that's easy to propose, but Life actually pulls it off rather well and is all the more fulfilling for it. 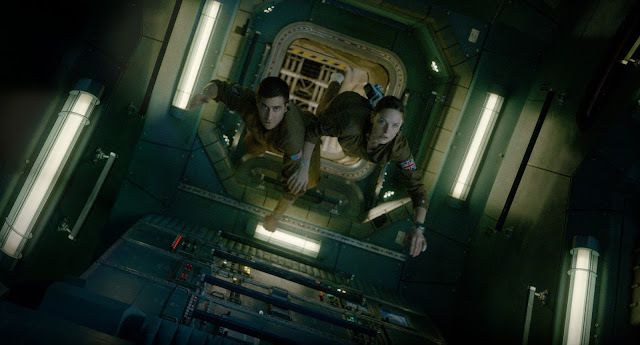 Doctors David Jordan (Jake Gyllenhaal) and Miranda North (Rebecca Ferguson) make their way through the ISS. Photo by Courtesy of Sony Pictures - © 2016 CTMG, Inc. All Rights Reserved. Life follows the lives of the aforementioned six astronauts who are living aboard the international space station. They have been waiting eight months for the arrival of a pilgrim capsule from Mars that holds samples from the planets soil. Naturally, the capsule has been damaged, struck by debris, and has since veered off course. It is now up to biologist, heroic astronaut, and all-around daredevil Rory Adams (Ryan Reynolds) to successfully reel in the capsule so that the scientist on board, Hugh Derry (a fantastic Ariyon Bakare), might begin to study the sample and hopefully discover the existence of a living organism outside of earth. What are the odds, right? Well, this is a movie so, pretty darn good. Also on board the ISS is quarantine officer Miranda North (Rebecca Ferguson), mission commander Ekaterina Golovkina (Olga Dihovichnaya), pilot Sho Murakami (Hiroyuki Sanada), and crew doctor David Jordan (Jake Gyllenhaal). Interesting fact: at the point in which we meet them Jordan is on his four hundred and seventy-third consecutive day in space giving the indication not that the guy necessarily loves space, but that he definitely isn't too fond of people. We gain little tidbits of knowledge such as this for each of the crew members, sans Golovkina whose attributes come through more in her actions than any such exposition, but more importantly is the film established the camaraderie and chemistry between the members of the team while dealing in some specific dynamics that make the ultimate outcome for each of the individuals resonate that much more. As it goes without much of a surprise, Derry does in fact discover a single cell organism within the sample (shocker, I know) that he is able to cultivate into a multi-celled organism after a few atmospheric adjustments. Though Derry is drunk off the discovery the remainder of his team begin to worry themselves with the fact the creature, which is named Calvin after a school that won a contest to name the alien decided to give it its namesake, is growing at such a rapid rate and rather than being more cautious, Derry is making simple mistakes such as forgetting to secure the lab in which Calvin is contained. The film gives itself a solid forty or so minutes of set-up and character development until everything goes sideways. This is a rather effortless transition as we know all will inevitably go south, but that the script implements the necessary instabilities not only in the situations, but in the characters so that once things due in fact go south we know there is no going back no matter how much we may like these people and continue to root for them. And so, the key to Life succeeding on the forefront and, by default, its larger ideas remaining with us days after seeing the film is the level of suspense and ultimate tension it delivers. What Life has up its sleeve that most horror movies do is that we know the antagonist will have malicious intent, but what it has that most horror movies don't is the fact the audience doesn't know what weapons that antagonist yields in order to accomplish such intent. Freddy has psychological warfare and knives for fingers, Leatherface has a chainsaw, Michael Myers has a kitchen knife, and Jason wields a machete, but given we meet Calvin in a stage of infancy there is no telling what he might be capable of or how he might become this being that may not even be completely hostile in his innateness, but simply understands that to ensure his survival-he must kill those who pose any kind of threat. With such an antagonist set in place there is also an inherent sense of tension-we know Calvin is up to no good because this is a movie, but we don't know when or how he'll strike. It doesn't hurt that we're also given that solid first act to become invested in the personalities on board the ISS so that not only is there suspense in what Calvin is capable of and what he might do, but also because we are now emotionally invested in what is going on. What is creating the suspense and ultimately the overriding tension is this level of uncertainty. Uncertainty as to what the most immediate threat in our characters' lives is capable of and uncertainty as to how these characters might even hope to compete with limited resources and only a limited amount of sustainable space. As the film progresses and Calvin demonstrates more and more of his "weapons" we are privy to the fact that these astronauts really do stand less and less a chance of surviving the bigger and more advanced their adversary grows. Calvin isn't shy about showing his dominance which would seemingly deflate the tension considerably, but this is why the setting is important. The characters are not only facing an unknown hostile creature, but are doing so in an atmosphere that is intrinsically hostile thus giving cause for that constant layer of uncertainty which increases the suspense every time Calvin makes a move. 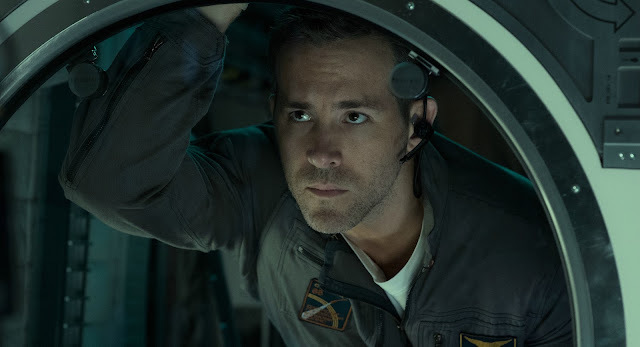 Biologist Rory Adams (Ryan Reynolds) looks on as a fellow scientist discovers the first proof of human life outside earth. Taken in this context, Life is a fine example of how genres can seemingly be smashed together to pull the best parts from each and create something even more interesting if not necessarily revolutionary at this stage in the game. The thing is, Life is by no means a science fiction film and doesn't use anything other than the setting of that genre to enhance the perception that there might be something more to this horror flick than blood and jump scares. Life is a horror movie through and through, but it is smart enough to know its setting is the bomb below the table despite the fact the audience is aware of it from the beginning. It would be easier to think of Calvin as the bomb under the table, but the film itself never tells us Calvin is of a bomb-like nature we are only left to assume as much because Life wouldn't be much of a movie if he wasn't. Making the audience aware of the dangers of space and all that can seemingly go wrong in the environment by making the introduction to the film that of a mission to rescue the damaged capsule that carries Calvin we are immediately made aware of the suspense in the situation. That even without the presence of an unknown alien life form-the combination of humans and space travel is enough to incite as much. The general state of anticipation that follows when Calvin is discovered is what then lends the film its great amount of tension. As Calvin grows-so does the intensity, as the tension grows-so does our emotional investment. Life walks these lines in fine form delivering a rather simple premise made effective by exercising some of the oldest tricks in the movie-making handbook. These well-worn, but successful techniques are only aided by the likes of actors such as Reynolds playing into expectations, but against type. And despite the fact that the film isn't able to navigate these courses of uncertainty followed by suspense that are always tinged with tension through to the end the efforts by Gyllenhaal and Ferguson especially aide the film in coming to a satisfying conclusion. The screenplay is gasping for reasons to go on longer than it needs to by the final act, but the actors are so committed to the peril their characters face that it's hard not to want the whole ship to stay afloat. Life is a fine example of what getting back to basics can do with a little modern initiative. It plays the game by having all its factors taken into consideration and play into the piece for maximum effect with only a few missteps along the way sidelining its otherwise admirable efficiency.